The Hottest Spot of Methane in the U.S.
October 29,, 2014—In a study, “Four corners: The Largest U.S. Methane Anomaly Viewed in Space”, published by NASA in October, it was discovered that the four corners area of the U.S. (Arizona, New Mexico, Colorado and Utah) contains the highest level of atmospheric methane in the U.S. Data taken from satellites have concluded that this area is a “hotspot” of greenhouse gases which are contributing to the global warming taking place on our planet today. According to NASA, this hotspot in the Southwestern area of United States accounts for 10% of all methane emissions from natural gas operations in the U.S. The EPA states that one pound of methane can trap 25 times more heat in the atmosphere than one pound of carbon dioxide. 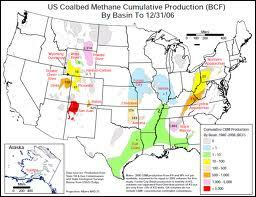 Methane is colorless, tasteless and odorless at normal temperatures and pressures. It is highly flammable and, in the proper mixture, is highly explosive. The common name for methane is natural gas, which is primarily methane, a fossil fuel which we add odor to for safety purposes. Most of us know this smell from natural gas cooking stoves. As techniques were invented to make it easier to mine coal and natural gas, the fossil fuel energy industry exploded. Improved technology led to rapid extraction of fossil fuels trapped in the underground coal formations. The four corners area shows the most intense concentration of methane. The question that the NASA study tried to answer is, “Why?” Why is there a huge concentration of methane gas over the four corners area? Some thought it may be from the release of methane during the mining of coal, but, if this was true, then the equally large mines, such as Powder River Basin in Montana and Wyoming, would show an atmospheric “hotspot” when viewed by the satellite. Others thought fracking was the explanation, but the study predates fracking on a large scale, as modern hydraulic fracturing began in 1998. The study began in 2003, before fracking became widespread in the U.S. Also, as with coal mines, the data would have shown hot spots in fracking areas as big or bigger than the hotspot over the four corners area–but it doesn’t. So, again, why the methane hotspot over the four corners area? Thousands of miles of roads and pipeline have been laid under the ground surface of this area, and much of this web is aging. 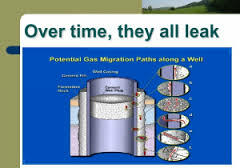 Eric Kort, one of the scientists studying the hotspot, says this, “The hotspot of methane is a result of leakage in the infrastructure that makes up the mining and processing plants in this area.” He states there are “many, many leaks in wells, pipelines, processing plants and maybe coal beds themselves. Nearly a trillion cubic feet of natural gas, i.e. methane, is sucked out of the four corners basin every year and its infrastructure is old and has developed cracks, holes, loose valves, ect.” He thinks that all these leaks turned into the four corners hotspot. Currently, there is some discussion concerning who’s responsible for the methane accumulation over the mining and fracking areas. The mining industry’s view is, “This is the way we’ve always done it and this is the way we will continue.” This attitude can no longer be accepted. Further research is necessary, but in the meantime, responsibility needs to be taken by the fossil fuel industry, with a move forward to enforce stronger EPA regulations on the extraction of coal and gas. Regulations which are not just “voluntary!” When it comes to global warming, our planet is not going to wait for long, drawn out decisions by politicians and the lobbyists who back them! Categories: Climate Change, Fossil Fuels, Global warming and its effects on animal population, Pollution | Permalink.